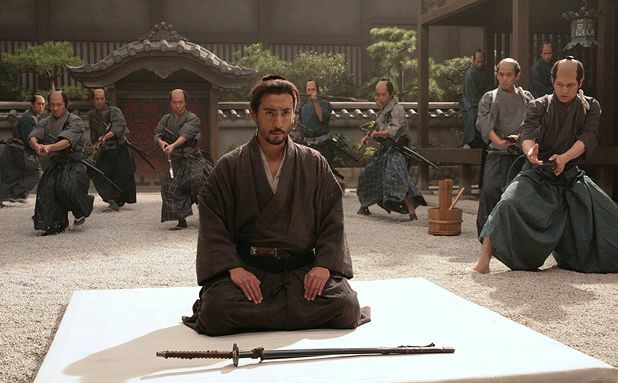 The rigorously restrained Hara-Kiri: Death of a Samurai is prolific Japanese director Takashi Miike’s follow-up to the exhilarating 13 Assassins. A companion piece, rather than a direct descendant, it’s a story of 17th century honour and vengeance which - despite a 3D presentation which suggests surging spectacle – is notable for its quiet dignity. Whereas 13 Assassins revelled in death, the noble, fascinating but unfortunately inferior Hara-Kari is solemnly haunted by it. Based on Masaki Kobayashi's 1962 film Harakiri, Miike’s reimagining begins with the arrival of Hanshirô Tsugumo (Ebizô Ichikawa) at the House of Li in Edo. His morbid request is that he be granted permission to commit ritual suicide within the grounds. Suspecting that this is one of a recent spate of suicide bluffs - disingenuously proposed in order to elicit charity - the wary senior official, Kageyu (Kôji Yakusho), recounts the fate of the last man who arrived with the same request, the unfortunate Motome Chijiiwa (Eita) whose bluff was called with horrible consequences. Matters take a sharp turn when a link between the two men is revealed. Miike directs with a patient, painterly hand and the impressive cast deliver intent performances, with the formidable Ichikawa taking top honours. Those expecting action will be desperately disappointed but Hara-Kiri’s more abstemious approach to the subject matter is hardly ill-advised. For the most part absorbing and affecting, it’s undermined by perplexingly redundant stereoscopy. In addition, Hara-Kiri becomes increasingly heavy footed as it progresses, wearing its not insignificant running time heavily in the final act. It’s far from perfection but those who are more interested in consideration than carnage might find that such dignified imperfection will do. 17th century Japan: when Tsugumo (Ichikawa) arrives at the House of Li and requests permission to commit ritual suicide within the grounds, a story of honour and vengeance begins. Miike directs with restraint and the result can be heavy-footed, but as long as you aren't expecting carnage, the quiet intensity pays off.